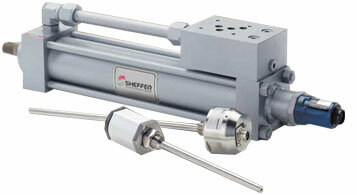 Sheffer manufactures all types of cylinders to meet our customers’ needs, including cylinders with electronic “position feedback” devices. These devices are required for many control circuits or monitoring systems. We routinely modify our cylinders to accept various devices. This includes, but is not limited to, Balluff , Gemco, MTS Temposonics and others. For more information on this product, download the PDF.